The kitchen is often thought of as the most functional room in your house. Why not make the most functional room the most exciting renovation project? A new kitchen dramatically increases the resale value on your house, should you ever decide to sell it. The kitchen lends itself to more creativity for the homeowner. With all the options at your disposal, a kitchen renovation can stress your budget. Even if you don’t want granite countertops, custom kitchen cabinets and high-end appliances, Wyeth Woodworking and Remodeling will offer the high-end craftsmanship you crave for your favorite kitchen components and design elements. 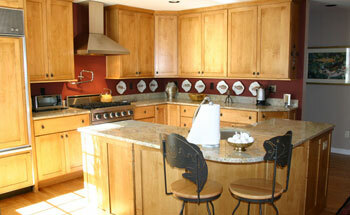 Only the best vendors and subcontractors will enter your home to work on the kitchen of your dreams. Be assured that your style will be reflected in all the functionality of your kitchen.